It’s that time of year again to recommend books that are perfect to read this season! A good old murder mystery is great for this time of year – you can snuggle up and get enthralled by an intriguing crime. This mystery in particular is especially Christmassy because the murder takes place on a train that’s been snowed in. Talk about a chilling atmosphere! During the Christmas season, it’s easy to get caught reading a lot of cute contemporaries, but something we love to do is dip into a completely different genre. Over Christmas last year we were reading ‘Divergent’ and this year, the two books in ‘The Fifth Wave’ really caught our attention. It’s also perfect prep for the movie’s release in January 2016! But speaking of cute contemporaries, nothing can quite beat them at this time of year. What’s great about short stories is they can be read in one sitting, and having twelve different romances to read really is a gift this Christmas! Geek girl? Check. Romance? Check. Christmas themed? Check. ‘All Wrapped Up’ has it all, so much so that Bee and I couldn’t wait until December to read it! Get to experience the beautiful and funny first date of Nick and Harriet, a couple ready to take the modelling industry by storm! When the chance arose to read the next book in Katy Cannon’s new YA series, I couldn’t contain my excitement. After loving the first book immensively (5 stars), I couldn’t wait to read about the same characters for a second time. 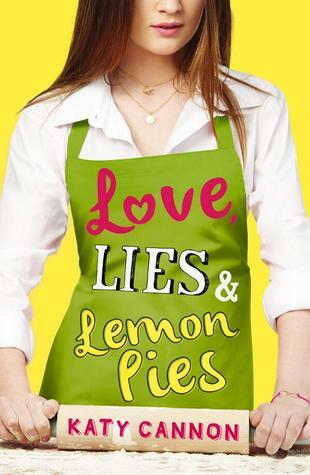 This book follows the perspective of Grace, probably the least prominent member of Bake Club during ‘Love, Lies and Lemon Pies’. She came off as a bit sour and pouty during the course of Lottie and Mac’s relationship, and because of this, I didn’t like her very much. However, after reading a book devoted to exposing what she’s really like, Grace really redeemed herself. Instead of a baking competition, the plot revolved around the latest school play, ‘Much Ado About Nothing’, my favourite Shakespeare comedy. Unfortunately, Grace didn’t receive the star role and she was lumped with a job backstage making and organising the costumes, which of course meant the existence of another after-school club, ‘Sewing Club’. The new boy, Connor, enhances her love life, though they may seem like chalk and cheese to begin with, they are the perfect pair. Every good relationship starts with some ‘love-hate’, right? Shakespeare backs me up on this with Beatrice and Benedick. What I thought was really original about this story line was that Grace actually changed. She wasn’t the drama queen or the queen of Drama and she certainly wasn’t the most popular. She wanted to become a more wholesome person and recognise her passion for working as a team instead of working in the spotlight. She didn’t revert back to her old ways, which was refreshing, and all her new friends accepted her for who she became, not who she once was. Connor and Grace’s relationship held the same circular structure as Lottie and Mac’s, however, nothing terrible happened to them as a couple because they communicated with each other. Communication is something that Lottie and Mac lacked, so it was nice to see an author focus on this important aspect of a healthy relationship. Of course, there was some family drama for Grace, along with friendship drama between Jasper, Ella and newly introduced Izzy, yet the play was the centre of the story. I loved that Lottie and Mac were still a part of the group, but they played cameo roles compared to Grace, Jasper and Yasmin. In fact, I was really pleased to find out more about Yasmin and for her to become a more prominent character – perhaps the next book by Katy Cannon will be from her point of view? All in all, Katy Cannon knows how to write a perfect contemporary novel, with an excellent mixture of romance, friendship and drama. I can’t help but give this novel 5 out of 5 stars as well, which is unusual, as sequels normally never parallel the debut. I look forward to everyone getting to experience this novel and hopefully enjoying it as much as I did!